Aston villa is an urban architecture house on the water with a great interior design created proudly presents by Eklund Stockholm New York. In shape of a boat, these villa offers a living unlike anything else, because of its design and of course its wonderful and stunning view. Located in the Pampas Marina, Aston villa was built on three levels with two sun decks, a large out over the water and a small sun deck against marina. On the ground floor is a kitchen and living room in open floor plan and door to a sun deck. On this level there is also a bathroom. On the upper floor there is a lovely living room with exit to the large sun deck. On the ground floor there is a large lounge and a well set-bedrooms and a bathroom.The light is ever present because of the area where the villa is located.I have to mention that Aston villa is designed in a classic style with paned windows, wood paneling and woodwork. On the sun deck you can enjoy the sun all day that it disappears into the horizon. The interior design is lovely is like whole house water filter in terms of the light, the pallet of the colors is great and very good combined with the marine sheep furniture, as you can see from the photos.Why is so extraordinary? Because it reflect the feeling of a holiday house with large space lot light and naturally the floating sensation. 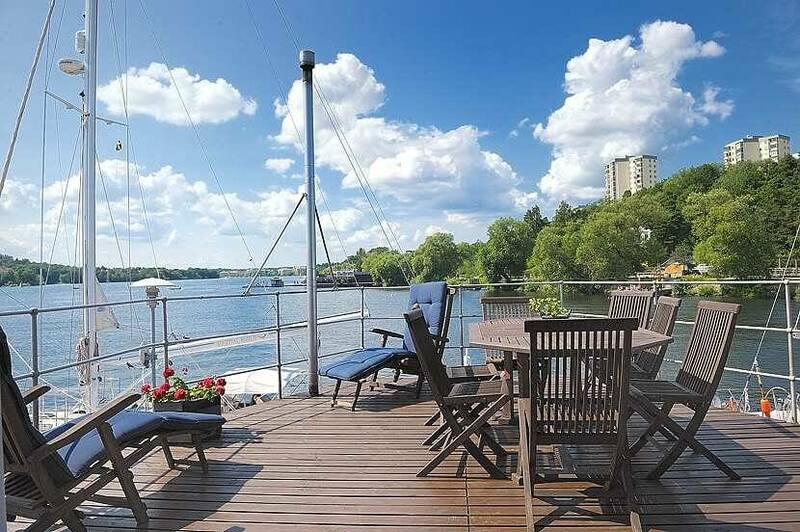 Also it is the perfect place fore take an swim directly after work, right from the veranda or in the winter to go skating right outside the kitchen door and in the evening to sit inside and enjoy the sunset over the ice.